For the most part, the newest generation of in-car navigation and entertainment technology will blow your socks off, regardless of the manufacturer. Even the most basic of vehicles can now be factory-outfitted with touchscreen, voice-recognition systems that are accurate, fast and can intelligently guide and entertain you – Mazda, Mitsubishi and Hyundai’s simple systems, for instance, are all quite good. Sadly, such is not the case for the much-ballyhooed SYNC/MyFordTouch system I had in two otherwise quite sterling SUVs, both optionally powered by a surprisingly powerful and mileage-positive 2.0-liter turbocharged four-cylinder engine. Complaints have been plentiful about Ford’s touchscreen system, which aims to provide easy access to navigation, music, climate and weather information – but hasn’t turned out to be quite the electronic miracle it promised. The “developed with Microsoft” badge on the console might have tipped me off. During recent drives of both the Explorer and the Escape, probably the easiest fail was the system’s total inability to find Keystone on the map. At all. The GPS coders who set up the system apparently didn’t include the community (or the ski hill), meaning that any wintertime visitors who rolled up from DIA in similarly equipped vehicles had to go on their instincts, or dig out their smartphones. I also had multiple lock-ups with the system as we tried to sync an iPod or flash drive, and when I needed it the most – merging onto the freeway in the morning for a trip to the mountains – the live traffic monitoring also completely failed to kick in, repeatedly. Moreover, the MFT screen, while improved from earlier iterations, still requires a level of precise concentration and accurate poking to work – I could never quite make the system’s four major functions, hidden in each corner, work without several attempts, seriously distracting me from the driving at hand. Pulling up weather information requires a half-dozen sub-menus, as well. Ford says they’re aware of the issues and have introduced software fixes to help offset the annoyances and speed up the connections. A minor quibble, I realize, compared to the overall positives provided by the two automobiles, but a pretty key component to see so poorly executed. In the meantime, there’s much better news about the small, high-efficiency 2.0-liter EcoBoost engine available as a powerplant for both Explorer and Escape. A four cylinder with just 240 horsepower may seem like a lightweight for the 4,500-or-so-pound Explorer, which bucked the trend and got significantly larger in its last remake, but it does indeed provide significant uphill yank. On the upgraded Explorer Sport I got to drive, there’s much more power at hand in the form of a 3.5-liter turbocharged V6, good for 365 horsepower – and also generating a combined 18 mpg. Stiffened suspension and larger brakes add to a more punchy experience, with paddle shifters to get a little more out of that stronger engine. Sport gets a litany of smoked window glass, head- and brake lamp lenses and a low-gloss grille, plus attractive, black-outlined 20-inch chrome wheels. 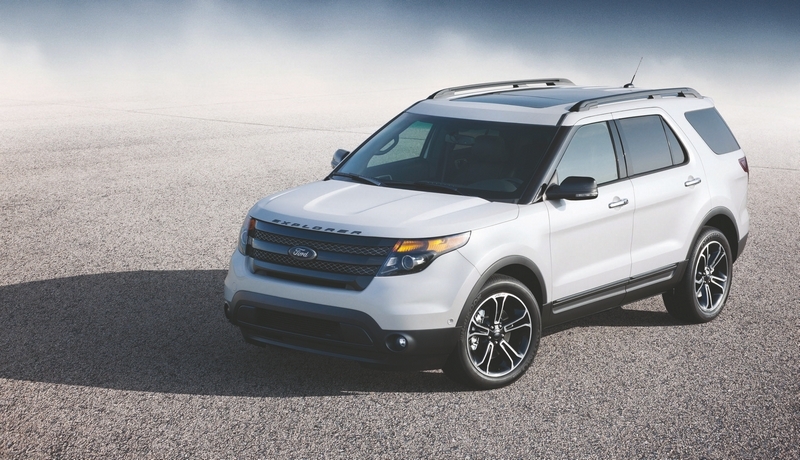 As with the standard Explorer, it’s huge on the inside, with flip-and-fold third row seating easily flattening for even more space. Escape, on the other hand, really shines with that 2.0-liter EcoBoost. At 3,732 pounds, the four-wheel drive version of the Escape can still reach 28 mpg or higher on the highway with the torque four-cylinder – though I got a combined total of closer to 21 mpg with a lot of aggressive urban driving. Escape is an entirely different vehicle from what you might remember in the past, a hyper-Europeanized machine with very distinctive looks both inside and out. Some of it’s a little extreme – the high-gloss, multi-layered dash and console with a CD player slot perched high above – and a nose and scalloped side panels that are very bold, indeed. Handling is sharp, with ride just a bit bumpy but acceptably sporty, for the few of you planning on tearing up the pavement in the more powerful Escape. I got a little less of the organic feel I was hoping for in the electrically assisted power steering, but was still happy with the overall experience.